It's Saturday! And we have some wonderful news to share today... we've got a new Design Team member! We're so happy to announce that Lynne Joncas has joined our team! Hi! 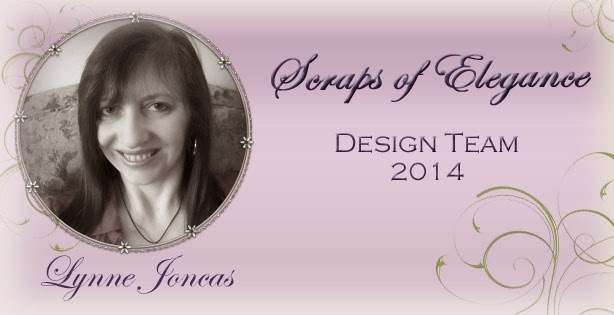 I'm Lynne Joncas from Ontario Canada, a married mother of a grown son and daughter,and I'm thrilled at the chance to create with these beautiful kits and be a part of such a fabulous group of artists! I've been scrapping since 2007, when I offered to create a little photo book for one of the kids' teachers who was retiring....once I got into the paper and embellishment sections at the craft store, the "little" book blossomed into a full 12 x 12 album and I was hooked! Since then I've developed a love for heritage pages, pet layouts (I have 2 dogs and 5 cats and once raised and cared for an orphaned baby squirrel) and of course loads of layouts about my family...as well as anything else that may catch my eye. Although layouts are my first love, I'm always inspired by the beautiful cards, home decor projects and other papercrafts I see and love to try new techniques, products and ideas! Welcome, Lynne, we're so happy you've joined us! Congrats Lynne! Happy to have you on the team!